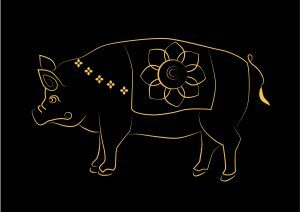 Are you ready for the year of the Yin Earth Boar – Ji Hai? In 2019, the Chinese Solar New Year begins Monday February 4 and all Feng Shui and Flying Star yearly adjustments and enhancements should be in place before then. The new year coincides with the period known as ‘Spring Begins’ and all the optimism of fresh, new beginnings. Farmers start their planting season on this day with hopes of a bountiful year. If you have not yet cleared your home and workplace, the coming weeks provide a perfect opportunity to do so since unfinished business carried into the new year will hinder your progress going forward. Remember, the energy all around you is constantly changing and many of the tools that were helpful in 2018 will be obsolete in 2019 so best to make changes in a timely manner. In Chinese culture it is customary to complete the following projects before the new year in order to start off on the right foot, minus your baggage from the previous year. Here are some ideas to help you on your way. Remove your front doormat and replace with a brand new one on Chinese New Year’s eve (February 3) so that last years’s energy won’t find its way into your home or business on this year’s footsteps.